If there is anyone who has figured out how to keep the pit from getting too deep, it is Scott. He launched this winery in his garage in Oliver under a three-year permit from the town (likely renewable for three more years) His annual production is limited to 575 cases. His commercial license relieves him from the cost of buying a vineyard while allowing him to buy grapes both in British Columbia and in Washington State, where grape prices (but not grape quality) are significantly lower. Born in North Vancouver in 1979, Scott’s interest in wine was sparked during a French vacation in 2000, starting in the Beaujolais region. In 2004 he and Kristie, his wife, went to Perth in Australia, where she enrolled in Curtin University’s world-renowned physiotherapy program. Scott, who had been taking business courses at Capilano University, switched to to Curtin’s winemaking and enology program. “I decided I didn’t want an office job,” Scott says. He made wine at two Australian wineries, including Stella Bella Wines and Rosebrook Estates. When the couple returned to Canada in 2008, for family reasons, they took their professional qualifications to the Okanagan. Kristie established a physiotherapy clinic there while Scott spent the 2008 crush at Road 13 Vineyards, working with Michael Bartier. 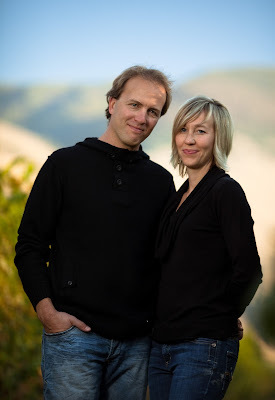 On the strength of Michael’s glowing recommendation, Burrowing Owl Vineyards hired Scott in 2009. “The only problem he had with me is my chosen NHL team,” Scott quipped. Scott is a fan of the New Jersey Devils while Michael supports the Montréal Canadiens. He has also helped Sandor Mayer at Inniskillin Okanagan during two vintages, with a primary focus on learning to make Icewine. “It was something I wanted to know,” Scott explains. “For me, it is all about learning and keeping on learning. It is always nice to work under another winemaker and see what they do differently – and see how you can improve your own technique.” In the 2012 vintage, he returned to Road 13, this time working with J-M Bouchard. Scott also kept a hand in at winemaking by crushing about a ton of grapes each vintage, producing wine for his family’s personal consumption. At this stage, Money Pitt is not much larger than a home winery. Scott has no intention of getting in over his head. The commercial license gives him flexibility in sourcing his grapes. His first white release, a blend called Markup, is Sémillon and Sauvignon Blanc grapes from a vineyard in Oroville, along with Chardonnay purchased at the end of the 2012 vintage from a grower in the Similkameen Valley. His red wines include a Meritage blend, a Syrah Malbec blend and a Cabernet Sauvignon/Cabernet Franc blend, with grapes sourced in both the Okanagan and in Washington State. With no tasting room planned, Scott is selling the wine through restaurant contacts, friends and family, with the help of a website that is currently under construction. Money Pit Markup 2012 ($15). The wine begins with aromas of herbs and wild honey. On the palate, there are flavours of ripe cantaloupe and tangerine with an herbaceous note from the Sémillon. 88. There is a new feature in the tasting room at Orofino Vineyards at Cawston: a mural showing the location of the various Similkameen vineyards from which the winery buys grapes. It reflects the special determination by winery owners John and Virginia Weber to make vineyard-designated wines that show off the terroir and also raise the profile of their growers. With the exception of the Merlot Orofino buys from the Oak Knoll Vineyard in Kaleden, the winery relies on Similkameen grapes. Passion Pit Vineyard, with 1.5 acres of Cabernet Sauvignon planted in 2007. The vineyard is operated by growers Greg Sanderson and Joyce Barton, long time Cawston orchardists. This vineyard gets its name from an old gravel pit once frequented by romantic teenagers. Scout Vineyard, a 4.2-acre property beside the Similkameen River where owners Murray and Maggie Fonteyne grow Syrah, Riesling and Pinot Gris. Orofino takes all of the grapes. Celentano Vineyard, owned by Carmela and Antonio Celentano, has a half acre block of mature Gamay that Orofino has been buying since 2007. They also grow Riesling but it is under contract to a major winery. Hendsbee Vineyard, with 8.2 acres of vines, is right next door to Orofino. The owners, Lee and Cheryl Hendsbee, are veteran orchardists who began converting their mixed orchard to grapes in 2006. Orofino buys all of the fruit. Blind Creek Vineyard, a 70-acre Cawston vineyard from which Orofino gets small lots of Sauvignon Blanc, and Chardonnay. The wines that Orofino has released this year (or will release this year) include all of the individual vineyard names on the labels for the first time. It shows commendable sensitivity by the Webers to acknowledge to people on whom they rely for quality grapes. “If they get kudos like that, the growers buy into the program,” John reasons. One outcome of this program is that Orofino released three different Riesling wines from the 2012 vintage. The differing characters of each Riesling more or less drove the vineyard-designate decision. It began when John decided to his Old Vines Riesling in barrels while fermenting the two other Rieslings in stainless steel. Previously, the wines were blended. Here are notes on the Rieslings. Orofino Hendsbee Vineyard Riesling 2012: ($22 for 300 cases). The vineyard has two blocks of Riesling (clones 239 and 21B) planted in 2006 and 2008. 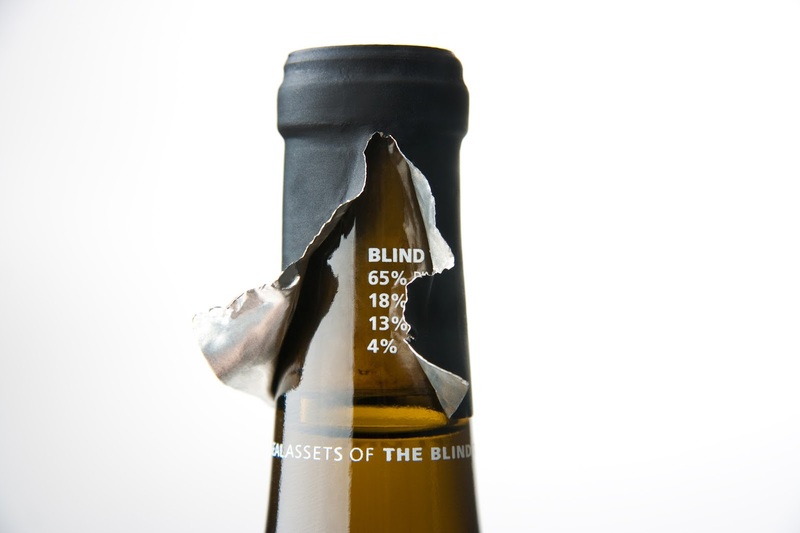 The wine, with 12.9% alcohol, is a racy and dry Riesling, with aromas and flavours of lime and with a spine of minerals. 90. 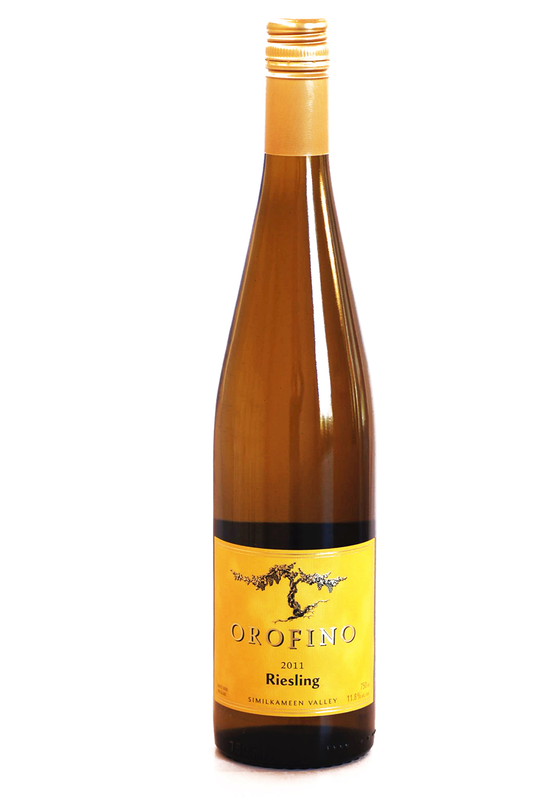 Orofino Scout Vineyard Riesling 2012: ($22 for 250 cases). “Not everyone likes searing dry Riesling,” John concedes. “You reach a slightly larger audience when you leave a bit of residual sugar in it.” This wine, with 12% alcohol, has 18 grams of residual sugar, more than twice as much as the Hendsbee. This helps to propel aromas of fruit and apples, along with juicy apple flavours. But the natural acidity balances this wine very well. 91. Orofino Home Vineyard Old Vines Riesling 2012 ($29 for 100 cases). This elegant wine is totally hand crafted. “It was barrel fermented in three old French and one new acacia barrel,” John says. “Half of that was fermented with commercial yeast and two I let go on their own. It was the first time I had ever done anything like that. There was lots of lees stirring.” This is an age-worthy dry Riesling with intense flavours of citrus and with a textural richness that elongates the finish. 92. Orofino Riesling 2011 ($20). This vintage is still available and worth picking up because it shows what an extra year in bottle can bring. The wine begins with classic petrol aromas. The texture is rich with flavours of citrus. The finish is dry but the extra year has softened the acidity very nicely. 90. Here are notes on the other current Orofino releases. 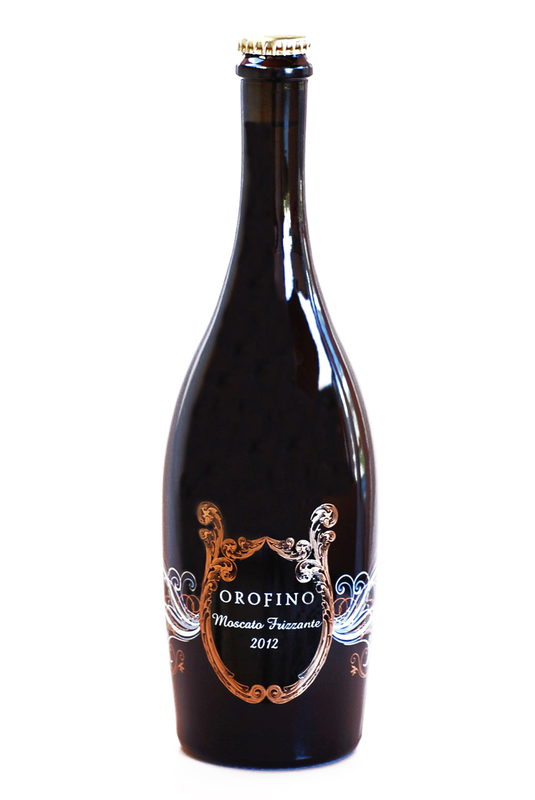 Orofino Muscato Frizzante 2012 ($25 for 500 cases). This is the second vintage of a carbonated sparkling wine that was a big hit in its first vintage, so much so that the winery has almost stopped making a Muscat dessert wine. “We do a tiny production of late harvest as well from our vines, but we prefer to drink bubble to late harvest,” John says. The blend is mostly Muscat but with a critical splash of Riesling and Pinot Gris, which bring up the acidity. This is a charming fruity wine with a crisp, refreshing finish. 90. Orofino Blind Creek Sauvignon Blanc 2012 ($23). This Loire style wine has herbal aromas and flavours, along with grapefruit and grapefruit rind and with a crisp dry finish. 90. Orofino Blind Creek Chardonnay 2011 ($25). This vintage is close to sold out but the 2012 is in bottle. Forty percent of this wine was fermented on older American oak. Intentionally, the wine was not encouraged to undergo malolactic fermentation. As a result, the wine has bright, refreshing flavours of apple and citris with just a touch of sweet oak. 90. 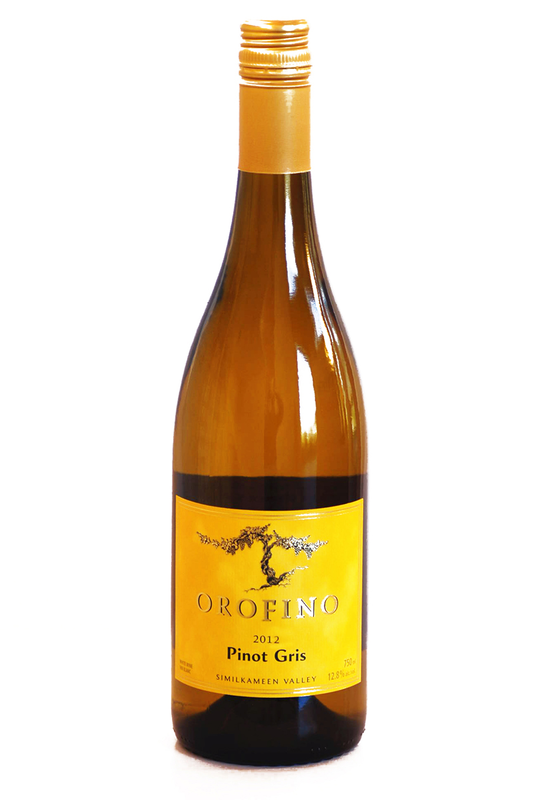 Orofino Pinot Gris 2012 ($20). This is a three-vineyard blend. The herbal aromas likely reflect the Similkameen terroir. On the palate, the texture is rich, with flavours of pear and apple. The finish is crisp. 88. Orofino Celentano Vineyard Gamay 2012 ($23 for 100 cases). This wine was fermented and matured in steel and was bottled five months after harvest to preserve its freshness. The wine has aromas of red cherries and flavours of plum with sage and pepper on the finish. This charming Beaujolais-style red should be especially delicious with a bit of chilling. 90. Orofino Home Vineyard Pinot Noir 2011 ($32). The winery has five clones of Pinot Noir, giving John a good palate of flavours to work with. The wine was made in the traditional gentle Burgundian style (lightly crushed grapes in an open-top fermenter). The wine was aged 16 months in French oak and was bottled unfiltered and unfined. It shows aromas of strawberry, with spicy cherry flavours and a lovely silky texture. 91. Orofino Scout Vineyard Syrah 2011 ($29 for 225 cases). This elegant, medium-bodied Syrah – again unfiltered and unfined – has bright peppery cherry aromas and flavours and supple tannins. With 13.4% alcohol, it is not the powerhouse that a hotter vintage would have yielded, but it is a food friendly wine. 91. Still to come from Orofino this year is the next vintage of Beleza, the flagship Bordeaux red, along with the 2011 Red Bridge Merlot, a pair of single vineyard Cabernet Sauvignons – and 70 cases of Petit Verdot Hendsbee Vineyard 2010. Usually, the Petit Verdot all is blended into Beleza but when the 2010 Beleza was put together, three barrels of Petit Verdot were left over. In its releases for 2013, CedarCreek Estate Winery is offering several wines for which the exact vineyard block is identified on the label. Vineyard-designated wines are nothing new in the Old World. There, the producers have had centuries to identify superior blocks, bottling such wines separately rather than having them disappear into blends. This has to be managed carefully. Obviously, superior lots will lift the overall quality of blends while keeping those lots separate can weaken blends. The solution lies in very good viticulture. Every block in a vineyard needs to be managed to its full potential, not just the superior blocks. It is evident that CedarCreek is bringing the best practices to all of its vineyards while taking pains bottle separately the wine from the best-performing blocks. I have recently tasted several of the winery’s single block wines, which CedarCreek has released under its Platinum or reserve designation. The wines are very fine, indeed. I also tasted CedarCreek’s estate tier of wines. The difference between the tiers, aside from price, is not that dramatic. That shows that the farming here is very good. CedarCreek 2011 “Block 5” Platinum Chardonnay ($29.95 for 533 cases). The fruit just sings in this bright and focussed Chardonnay. The wine begins with aromas of citrus and minerals, leading to flavours of honeydew melon. The finish is crisp and tangy. This is the result of fermenting the wine in 500-litre puncheons and not allowing it to undergo malolactic fermentation (which makes Chardonnay buttery). The wine was aged in barriques and puncheons. 93. CedarCreek 2012 “Block 3” Platinum Riesling (Sold out but may be available at the winery; 300 cases produced). With only eight per cent alcohol, this wine would be very much at home in a fine Mosel cellar. The wine’s 12 grams of acid gives this wine its racy character but the balancing 25 grams of residual sugar lifts the aromas and flavours of lime and grapefruit. The 21-year-old vines on Block 3 are not irrigated. As a result, the roots go deep in the search for water, bringing up notes of minerals on the aroma and palate. 92. CedarCreek 2010 “Home Block” Platinum Pinot Noir ($39.95 for 559 cases). This is one of the most impressive Pinot Noirs in the Okanagan, period. The grapes are from two small blocks within the Home Block; one with vines planted in 1991 and the other with vines planted in 1995. This shows in the concentrated flavours and textures of the wine. Aged 16 months in French oak, the wine begins with toasty, cherry aromas. On the palate, there are flavours of raspberry and cherry, with spice on the finish. The texture is just beginning to develop the variety’s classic silkiness. This will easily age gracefully for another five years. 92. CedarCreek 2012 Gewürztraminer ($17.95 for 2,250 cases). CedarCreek started making this wine by pressing the grapes gently and slowly over a 12-hour period. The idea was to capture the sometimes fragile aromatics. The winery succeeded. The wine begins with spicy floral aromas and delivers abundant fruit flavours – lychee, grapefruit and peach. The rich texture and the dry finish very much recall good Alsace gewürztraminer. 90. CedarCreek 2012 Ehrenfelser ($18.95 for 2,000 cases). Most of the grapes for this wine come from a Westbank vineyard that was planted in 1977. CedarCreek unlocked the exuberant fruity aromas and flavours in 2002 by removing some of the canopy and exposing the grapes to more sunlight. The wine subsequently acquired a cult following. This is a good example, with aromas of peach and citrus and with flavours of peach, pineapple and grapefruit. There is just enough acidity to give the wine a crisp finish. The flavours go on and on. 90. CedarCreek 2012 Pinot Gris ($17.95 for 5,8o0 cases). This wine was fermented partially with wild yeast. Also, 10% was fermented in French oak. It all added a bit more complexity to a wine with appealing flavours of apple, pear and citrus. The slight touch of residual sugar, well balanced with acidity, pops the flavours very nicely. 90. CedarCreek 2012 Riesling ($17.95 for 2,200 cases). This is made in a similar style to the Platinum Riesling but with a bit more alcohol, less acidity and less residual sugar. It begins with floral and citrus aromas. On the palate, there are flavours of lemon and lime. The spine of minerals and the crisp acidity give the wine a refreshing finish. 90. CedarCreek 2012 Rosé ($17.95 for 700 cases). Made with Pinot Noir, this wine has a deep ruby hue. It has aromas and flavours of cherries and strawberries, with firm structure. The finish is almost austerely dry. This wine needs to paired with food. I would have enjoyed it more if the winemaker had left more residual sugar. 86. Ian Sutherland, the founding winemaker at Poplar Grove Winery, once said the winery’s maximum production was unlikely to exceed 2,000 cases a year. That was before Tony Holler came on board in 2007 as the winery’s controlling partner. A native of Summerland, Tony has been an emergency room doctor and then a successful pharmaceutical entrepreneur. Earlier in the decade, he built a home on Naramata Bench lakefront and planted a small vineyard near the original Poplar Grove vineyard. He and Ian had become friends and, when Ian needed a partner, Tony responded forcefully. A serious wine collector, he had been drinking Poplar Grove wines for years. He had also come to believe that the Okanagan can produce world class wines. He consulted winery owners elsewhere. All told him that he needed to scale up to a certain size in order to afford the talent need to make and sell top notch wines. “So Ian and I, along with consultants, developed a business plan for a winery that was capable, over time, of going to about 25,000 cases,” Tony said. To secure the quality grapes needed for that growth, Tony and his wife, Barbara, invested in vineyards. In conjunction with these moves, he had two new wineries built. One is the showpiece Poplar Grove Winery that opened last year on the side of Munson Mountain. The stunning view from its floor to ceiling tasting room windows takes in the city of Penticton. The second winery, just down the road, is Monster Vineyards. Most of the wines for both Poplar Grove and Monster are made in this second facility. It also has a tasting room, take advantage of the fact it is one of the first wineries on the Naramata Road and draws plenty of visitors. The business strategy is to deliver good, affordable wines under the Monster label for day to day drinking, and wines under the Poplar Grove label that might turn the heads of collectors and connoisseurs. A tasting of recent releases show that the strategy is working. Poplar Grove Chardonnay 2011 ($22). This is a textbook Chardonnay with all the crisp and appealing fruit-forward flavours preferred by those with a bias against oak – but just enough barrel-fermented wine in the blend to add the complexity that this fine varietal deserves. The wine begins with aromas of tangerine, leading to honeyed and lightly buttery citrus flavours. The bright acidity creates a refreshing finish. 91. Poplar Grove Pinot Gris 2012 ($20). This is a charmer, beginning with aromas of pink grapefruit. On the palate, there are flavours of pink grapefruit, lime and apple. The texture is juicy and the finish is crisp and refreshing. 91. Poplar Grove Viognier 2011 ($25 for 430 cases). This wine begins with aromas of apricot, tangerine and wild flower honey. On the palate, there are generous layers of apricot and cantaloupe flavours. That ethereal spine of tannin that comes with the variety gives the wine a focussed discipline on the finish. 90. Poplar Grove Blanc de Noirs 2012 ($24.90). Intense in flavour and vibrant in personality, this delicious rosé is made with Malbec and Syrah. It begins with aromas of raspberry, cherry and rhubarb and delivers flavours of cherry and rhubarb. The finish is balanced to dryness. 91. Poplar Grove Merlot 2009 ($30). This is a wine that seduces the consumer with its sweet aroma and rich flavours. Indeed, the 15.4% alcohol brings to mind that classic Ogden Nash quip: “Candy is dandy but liquor is quicker.” However, the wine has so much substance that the alcohol does not stand out. The wine, which had 18 months in French oak and another 18 months in bottle before release, begins with aromas of cassis and vanilla. On the unctuous palate, there are flavours of plum, black cherry, chocolate. The finish is persistent, with a hint of spice. 92. Poplar Grove CSM 2009 ($ for 650 cases). The name indicates the blend: Cabernet Sauvignon, Syrah and Merlot. This is another ripe wine (15% alcohol) that spent 18 months in French oak and another 18 months in bottle before release. The result is an elegant wine with a polished texture. It begins with aromas cassis, cherry and vanilla. 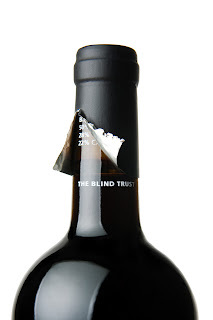 On the palate, there are flavours of black currant and plum with dark chocolate and an earthy, gamy undertone. The Cabernet in the blend contributes to a firm spine, denoting this complex wine will age well a few more years. 91. Monster Vineyards Riesling 2011 ($20). This wine has begun to develop some of the classic petrol notes along with its citrus aromas. There is a touch of grapefruit on the palate. The finish is dry, leaning toward austere. 87. Monster Vineyards Rosé 2012 ($18). Refreshing and juicy, this is a good summer wine, with aromas and flavours of cherry and rhubarb. There is just enough residual sugar to make the aromas and flavours pop. 88. Monster Vineyards Merlot 2011 ($20). This is a quaffable and simple Merlot with cherry and raspberry flavours and soft tannins. 86. Monster Vineyards Cabs 2011 ($20). In contrast to the Merlot, this red overdelivers. It presents a fat gob of sweet fruit flavours to the palate – black cherry, black currant, vanilla, chocolate and coffee. This is generous and satisfying red for summer drinking. 89.